This is a mirror of the story from the St. Louis Post-Dispatch on October 8, 2003. Check here to see the original URL. Elonka Dunin, an amateur cryptographer, cracked this code. A standing-room-only audience of computer hackers - a notoriously tough crowd - had given her speech on al-Qaida codes a standing ovation. Speaking at the 2002 DefCon conference of computer enthusiasts, Dunin had mentioned Kryptos, a sculpture in a courtyard at CIA headquarters in Langley, Va. Dunin, a St. Charles software developer who dabbles in codebreaking as a hobby, had recently begun studying Kryptos. Letters inscribed on the sculpture form a code that has remained unbroken for more than a decade. As Dunin tells the story, after the speech, a stranger approached to congratulate her. "I'm from Langley," the stranger said in hushed tones, according to Dunin. "I think I can get you in." Months later, in October of last year, Dunin was at CIA headquarters, delivering a version of her talk to code experts. There, she was able see the 12-foot-high metal Kryptos sculpture up close. The CIA commissioned the piece in 1988 for the courtyard of its new building. Sculptor James Sanborn, who designed Kryptos, has used encrypted messages in several of his outdoor works. Standing beside the curvy dark sculpture, which resembles a giant S shape lying on its side, inspired Dunin to rev up her efforts to crack the code. By April, she was corresponding daily with a team of cryptographers, translators and programmers from around the world to unravel the mysterious Kryptos. They haven't cracked Kryptos yet. But, with Dunin leading the charge, the team has taken a major step in that direction. 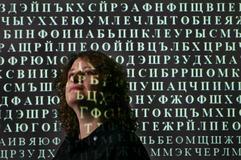 They've cracked the code of the Cyrillic Projector, a sister sculpture to Kryptos at the University of North Carolina in Charlotte. Both sculptures were designed by Sanborn. "Solving it was very intense," said Dunin. "It's definitely motivated the group, and it's given us some big clues for tackling Kryptos." While the code on Kryptos is in English and Morse code, the Projector is encoded with Cyrillic, a Slavic alphabet used in Russian and other languages. Therefore, solving the Projector puzzle required decoding the Cyrillic into Russian and then translating into English. Raised speaking Serbo-Croatian, which uses the Cyrillic alphabet, with a computer programmer for a father, Dunin was suited to solve the puzzle. The 8-foot-tall cylindrical Projector sculpture, lighted from the inside, coats adjacent buildings at night with a bright jumble of Cyrillic characters oddly interrupted with a single English word: Medusa. In five months, the team had cracked the code. The text turned out to be encoded by a tricky version of a Vigenere code. In that code system, each letter of the message is decoded with a different key alphabet. The key to the sculpture's puzzle was discovered by two cryptographers, including Mike Bales, a Michigan computer programmer on Dunin's team. But it was Dunin, with the help of her father, Stanley, and Anatoly, a family friend, who produced the final English translation. The message turns out to be from KGB documents describing Cold War spying methods and Soviet dissident Andrei Sakharov. "Secret agents who develop controllable sources of information will get promotions," the decoded, translated message reads at one point. More than 25 spelling errors dot the final Russian text. "Computers would not have been able to have cracked this code," said Dunin. Some believe that codes terrorists use to communicate are hidden digitally on supposedly innocuous Web pages. Dunin, general manager of online games at Simutronics in St. Charles, has become sort of a world expert. "I wanted to do something to help after 9-11," she said. She doubts whether al-Qaida is using the codes. But that hasn't stopped her from delivering her detailed speech on the subject to law enforcement officials in St. Louis as well as CIA analysts. When she talked at the CIA, she says, officials at the agency's Information Operations Center presented her with a colored medal depicting an eagle above a globe covered in ones and zeros. "They asked me, 'Can you decode it?' I looked at it - it was binary," she said. She knew binary - the language of computers - by heart. "But I whispered to the officials - 'You know there's a typo on this?'" she said. Translated, the numbers read "IOC @CAA" - someone had replaced the second I in CIA with an A, Dunin figured. A CIA spokesman, who said Dunin did a "good job" on her talk to the officials, told the Post-Dispatch that the mistake was a "graphic design error." Now Kryptos looms large as ever for Dunin's team. Ninety-eight letters of its nearly 1800-letter code have remain unsolved since 1990.